Yesterday, January 15, 2019, I got an email notification from Google Search Console. In the e-mail, Google sent a report related to the latest error issue on my Blog AMP page. What's worse, one error caused almost half of my blog articles to be affected by the latest AMP error warning. There are around 72 articles that get the problem. This error occurred because the image I uploaded was an image that was not in accordance with Google AMP's image guidelines. Yes, the image that I uploaded in the article is too small than the minimum size. 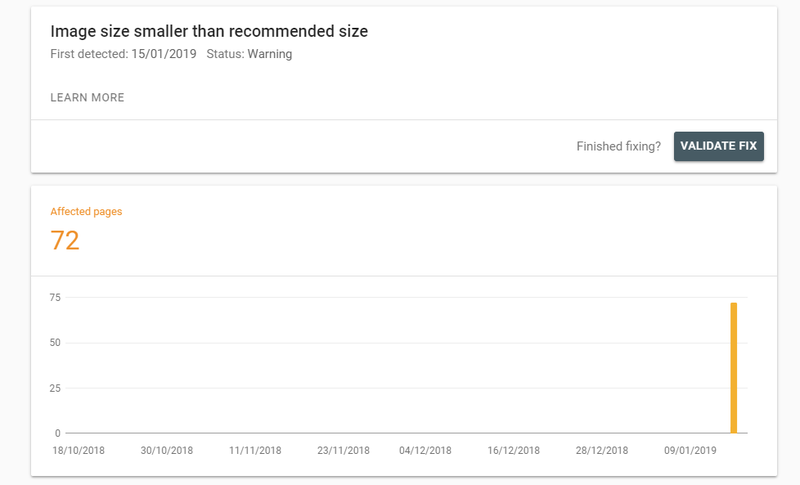 In the AMP report dashboard in the Google Search Console, there are around 72 articles that have errors warning "Image size smaller than recommended size" due to images that are too small, with sizes less than 1200 pixels which are the minimum size recommended by the AMP data structure. But it seems we don't need to worry too much, because based on what was explained by Search Console that the error does not make our AMP page invalid. This means that web pages are still valid AMP and can still be crawled by Google properly. However, repairs still need to be done if necessary. According to Google's support page, Error warning: Image size smaller than recommended size can cause your blog page to not appear with all the features of Google AMP. And the possibility will not appear on the Discover AMP Card or Google AMP Carousel. According to Google it can also cause a decrease in traffic on your website. To fix this error, inevitably you have to re-upload the image that caused the error, with a larger size and in accordance with Google AMP's data structure guidelines. I will describe the image in accordance with Google AMP guidelines. When done, click SAVE. Don't forget to validate improvements in Search Console. Which Structured Data does it prefer: JSON-LD or Microdata? AMP-BLOGGER.COM is a website that containing the content of blogging tutorial, dedicated to users of the Blogspot platform based on AMP HTML. This blog contains several categories including AMP Blogger Templates, CSS Tutorial for Blogspot, AdSense Tips, AMP HTML Tutorial, AMP SEO, AMP News, AMP BLOGGING tutorial. For any questions, please write in the comments column of each related article.